seven + = 9 Required Please enter the correct value. Esports are the fastest-growing sports in the world and will be bigger than baseball, basketball, football, and soccer combined in the next 15 to 20 years. From May 2017 to May 2018, the number of people who viewed the League of Legends final increased by 20%, from 106 million to 127 million people. To put these numbers in perspective, only 111 million people watched the 2017 Super Bowl. Plus, viewership actually decreased by 7% to 103 million people in 2018. Video games used to be seen as a waste of time, with parents telling their kids to stop playing and go outside. 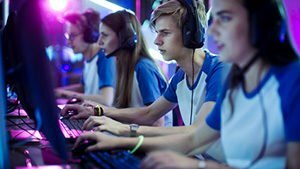 Now that the esports industry is set to hit $1 billion next year, those same parents are hiring video game coaches for their kids, colleges are handing out video game scholarships, and major brands like Coca-Cola, Red Bull, McDonald's, and more are spending a collective $172 million advertising tournaments and sponsoring players. Esports athletes like Tyler 'Ninja' Blevins are making millions of dollars every month, and stadiums with the capacity to hold more than 100,000 people are selling out to watch these events live. And the growth potential is truly incredible. Unlike with traditional sports, anyone can be an esports athlete. You can be any age, shape, weight, or size – there are no physical barriers to entry to becoming a professional gamer. Plus, there's hardly any barrier to entry, since 4.1 billion people already have access to the Internet and can play by themselves on a computer, phone, or gaming console whenever they want. Esports revenue increased 32.8% from $493 million in 2016 to $655 million in 2017 and is on pace for another 38.3% increase to $906 million this year. It will cross the $1 billion mark next year. But this is just the beginning. We are only witnessing the first generation to adopt esports, and the growth could be parabolic as new generations grow into it. If it sustains this level of growth, esports could be worth more than $5 billion by just 2025, more than 500% growth over this year's value. And some of the best companies on the planet are already diving into the esports industry headfirst. Esports didn't begin taking off until content became more accessible to gamers. In 2014, Amazon.com Inc. (Nasdaq: AMZN) paid $970 million for a live-streaming platform called Twitch. Twitch is essentially YouTube for esports. People can watch their favorite gamers play live or view clips from the past. This confused Wall Street at the time because few understood why people would pay money to watch other people play video games in lieu of playing themselves. Twitch is disproving that notion as 15 million people are watching their favorite streamers for an average of 95 minutes every day. Twitch makes money from advertisements that play when viewers begin watching a stream, subscriptions that allow viewers to watch their favorite streams advertisement-free, and partnered streams where the donations viewers give to their favorite gamers get split with the company 50/50. By 2020, Piper Jaffrey analyst Gene Munster believes Twitch could be worth $20 billion, generating $1 billion in annual revenue. Adding $19 billion in value over six years is no drop in the bucket, even for a giant like Amazon. In less than a year, Fortnite has become the fastest-growing game of all time, amassing over 125 million players worldwide. 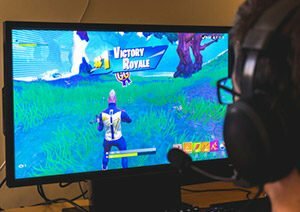 Although gamers can download Fortnite for free, 70% of players have spent an average of $40 on the game despite the fact that the products available are cosmetic and don't actually help you win. Fortnite made $318 million in May – almost $100 million more than any free-to-play games has ever made in a month – and is on pace to make $3.5 billion in its first full year. While you can't invest directly in Epic Games, you can still invest in Tencent Holdings (OTCMKTS: TCEHY), which owns 40% of Epic. Tencent also owns Riot Games, the company responsible for creating League of Legends. League of Legends produced $2.1 billion of revenue in 2017, and we expect that to double by 2021. In 2017, Tencent games made a total of $12.7 billion, which accounted for over a third of the company's total revenue. 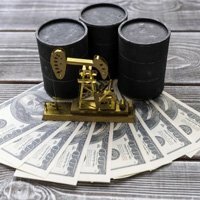 Analysts are expecting $16 billion in 2018, and we think even that is conservative. While Amazon and Tencent are solid plays in this field, we've found an even better opportunity. Our top esport stock doesn't make video games itself, but it does supply the most important hardware necessary for esports athletes to compete at the highest level. In fact, some players are spending over $20,000 on this company's products. Plus, analysts are predicting its share price will grow by 130% over the next months.